As you can probably see, my handwriting is even more illegible than usual. It's actually meant to say "whenever" somewhere above, but my scrawly handwriting makes it look like I can't spell to save my life (I promise you, I can!). 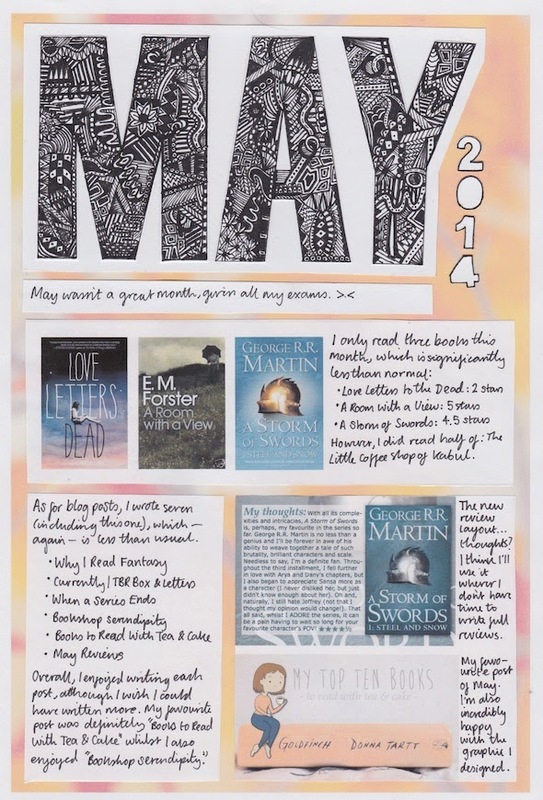 Anyway, like it says above, May wasn't a brilliant month; I had a load of GCSE exams, very little reading time (it was all taken up by revision) and even less blogging time. Rachel's post "Let me tell you a little something about me…"
Shameless plug, but I also sorted out an email newsletter for this blog (at last!) which you can sign up for through my sidebar. Looking ahead to June, I won't have much time to blog (more exams…) but I do have a few ideas planned. E.g. I'm planning a post where I gif the pages of all my old notebooks – not sure if I'll have it done by June though. But I'm halfway through several books (all of which I hope to finish my the end of June, after my exams): The Little Coffee Shop of Kabul, Brideshead Revisted, A Delicate Truth, The Goldfinch and Decoded. Oh, and I was sent Reasons She Goes to the Woods for review (it arrived this morning) and it looks TOTALLY "my thing"! Every month year, I have a random urge to re-read Harry Potter and so my obsession has resurfaced this month (not to say I'm not always obsessed!). So, I've been watching the films, listening to the audiobooks and doing everything Harry Potter related of late. I've also began to reevaluate my Hogwarts house – I'm beginning to think I'm a Ravenclaw? And I'm also Game of Thrones obsessed at the moment; I've spent the rest of my spare time (when I'm not re-watching and re-reading Harry Potter, I mean) drawing all my favourite characters – just added Dany to the collection. Exams and revision have taken over my life… sad, but true. Anyway, that's it for May. Nothing that interesting, although it wasn't awful either. How was May for you? Did you read any good books that you'd like to recommend or discover any particularly amazing blogs? I recently read/reviewed Ready Player One and I really enjoyed it! Yay – that's good to know! I like the bullet point style this month! I love the chart you make. Is it called a chart? I think it's so cute and different. I'm reading the Harry Potter series now. It's my first time reading them. *blushes furiously and backs into a corner* I can't believe it's already the end of May. Hope your June is filled with more books! I've heard loads of good things about Ready, Player, One although I have yet to pick it up. It's been sitting on my shelf for a month now, haha! And because of what you said about A Storm of Swords, I'm definitely reading it this month. Ugh, I've had loads of exams this month too and I'm so glad I only have two left (although they are the Maths exams and that is NOT my best subject!). Then I will be free as a bird, whoohoo! I decided to click on a question mark at random and I got my own blog! It's nice to know that you read it! Yes! Another Ravenclaw! The only people I can think of that are Ravenclaws now you, me, Rachel (booktastic Reviews), and I think Georgia from The Bibliophile is (I'm not too sure about the last one) Join us! Harry Potter re-reads > most other aspects of life. <3 <3 <3 !!! !